The focal feature of this card is a technique I love so much. It's one of my favorite ways to play with ink blending! So many talented artists use it beautifully, so this is just my little take. I love the dimension it achieves, without too many fussy layers. To start, I used a card base and blended five colors, one on each quadrant of the card and one transition color in between. 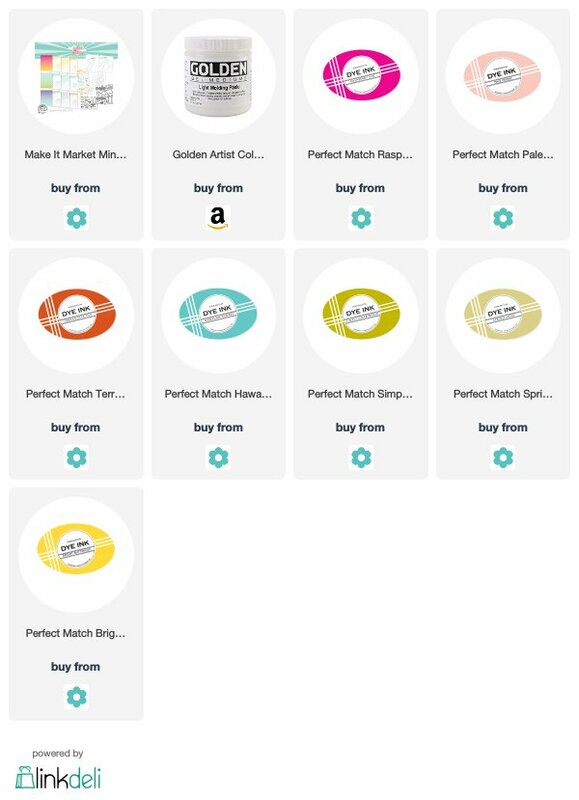 I used Pale Peony on the top left, Hawaiian Shores on the top right, and Bright Buttercup in between. For the bottom, I used Pale Peony on the left, Bright Buttercup in the middle and Spring Moss on the right. This is where the fun begins! 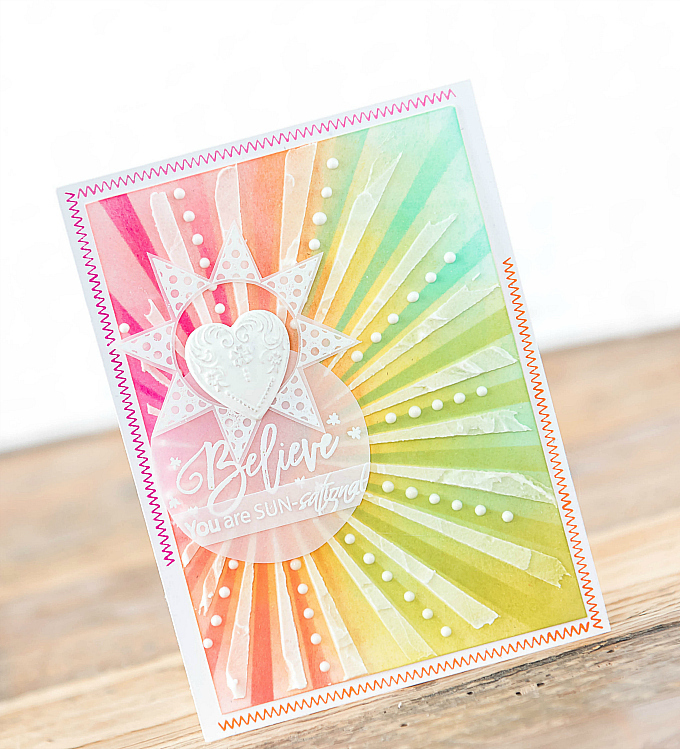 I used PTI's heartburst stencil from the Sunshine and Rainbows kit, and used intensified versions of the colors below to accentuate the rays. On the top left I used Raspberry Fizz, on the top right I used Hawaiian Shores, bottom left is Terracotta Tile, and bottom right is Simply Chartreuse. For the final layer, I slightly adjusted my stencil, and used Golden Light Molding Paste to achieve yet another layer of dimension. I love that this paste is not perfectly opaque, so it lets some of the color peek through. You can get even more color to peek through, by making the paste layer thinner. Also, this final layer would look gorgeous with a glitter paste, versamark + embossing powder, mica powder, or any other medium that works well with a stencil. A few finishing touches, like the stitched details from this sweet Precious Remembrance stamp, and some Nuvo Crystal Drops help balance everything out. I added a stamped and embossed sun and sentiment (retired TCM stamps), along with a resin heart. I hope you'll give this fun technique a try and play around with colors, mediums and variety of layers. 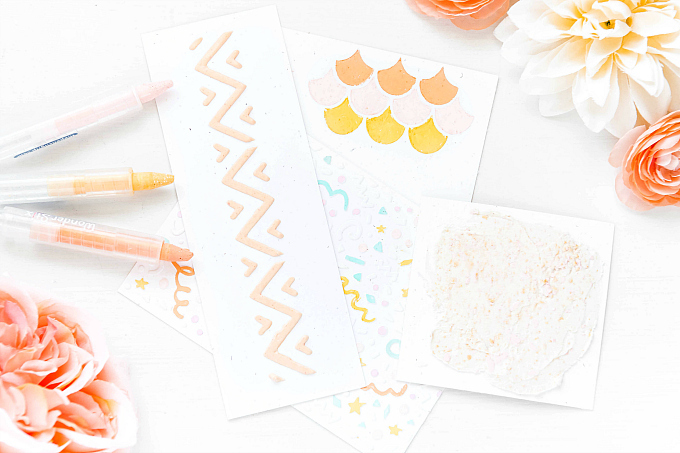 I think this would be a fun technique to try with florals and other types of stencils too! If this is a departure, Ivana, I'd book that flight! So pretty! hehe Michele, I'd take you in a heartbeat! Sending hugs sweet crafty friend! Thank you for all of your love and support! I love this little side trip you've taken Ivana! It's still one of your usual fabulous creation though. 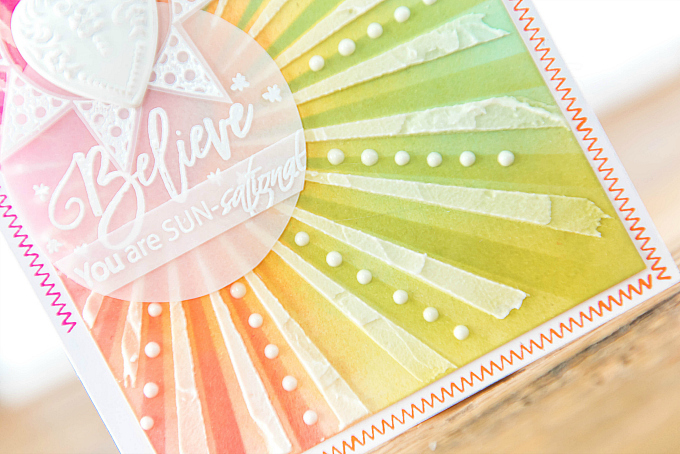 The beautiful colors, the frosty whites and all of those perfectly sweet dots...love it! Thank you so much, Lisa! You know me so well!! :) It seems that no matter the technique, whites and dots are never far away! lol Sending hugs! Oh my word!! This is AMAZING!! 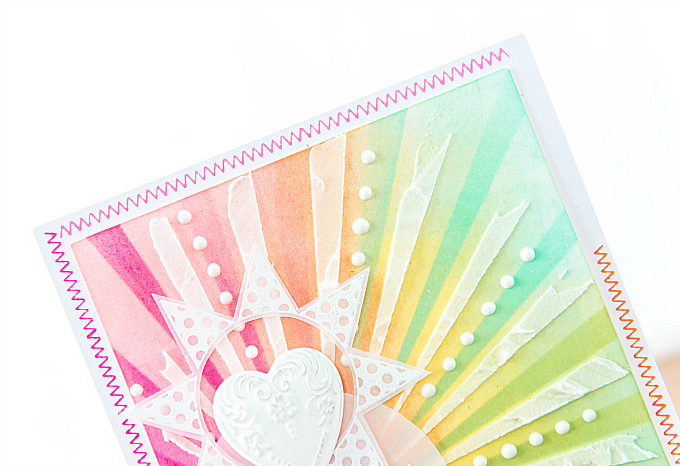 I love the pretty blended colors and then you use of the paste over them. Such a cool card!! Aw, Nora, you are too kind! Thanks so much for the super sweet note - I loved playing with this technique - so glad you liked it! Hugs dear crafty friend! Yes, a bit of a departure from what I usually see you make, but still creative & beautiful as always! Thank you so much, Greta! You are so, so sweet! Thank you so much, Aneta! Slowly but surely my pastel range is getting a little bigger. Who ever thought that would happen! ;) Miss you too, dear friend!